Now we talk business when it comes to crossbows! With our Barnett Quad 400 Crossbow Review, you will see how excellent this unit is in the Barnett range. For power in hunting, this is the crossbow to have for all the right reasons. It has optimized power and superb firing accuracy and recently updated with some great new features. 1 Why The Barnett Quad 400 Crossbow is made for you? Why The Barnett Quad 400 Crossbow is made for you? Maybe, you have been searching through loads of crossbows online! From the first time buyer to the experienced hunter in crossbows, the Barnett Quad 400 made for you. Barnett has been the leader in making some of the best crossbows in the market. 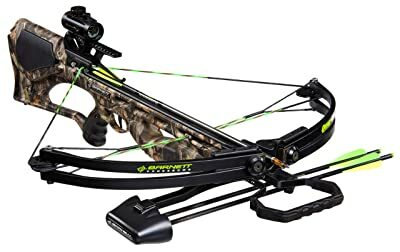 This best selling package has all the basic accessories for you to start enjoying archery for target shooting to hunting. It is simple to put together with the detailed instructions you receive in the package. Once assembled it is a powerful crossbow in your hand that is ready for any action. This unit is accurate with a 150-pound draw weight and a speed of shooting up to 345 FTP. Holding the device in your hands is lightweight and great when you are out in the field. For extra accuracy, you receive included a 4 x 32mm scope and sighted in close to zero, straight out of the box. The Barnett Quad 400 has a draw weight of 150 pounds and best to invest in a hand-crank cocking device. With the device, installed cocking the crossbow will be much easier. Alternatively, you can also invest in a rope-cocking device. The bow is superb when in need of hunting as it delivers the power you need. It uses a 400-grain arrow and the speed is fast up to 345 FPS and translates 106 ft lbs kinetic energy. The units suitable for hunting small to medium game and does not include a sling. Many hunters do not recommend this unit for hunting rabbits because of the power. Moreover, it’s louder than less powerful devices. You also receive the Barnett Quad 400 Crossbow with 3 by 22-inch arrows. They are mostly good for target shooting and sighting in the scope. However, they not made for hunting and best to buy Carbon Express arrow. Where design comes into play, some users complained about the string supplied with the bow as it frays. They have made some minor changes to the bow with a high-density gas assist stock with integrated cocking device attachment. This attachment concealed with a cheek piece. It has a thumbhole grip with a power stroke of 15.5-inches. You receive a 5-year limited warranty. The complete package option includes 4 by arrow quiver, 3 by 22-inch arrows, and a choice of a premium red dot sight or a multi-reticle scope. The crossbow is very accurate when used. Without a doubt, this crossbow is one of the best in its range. For the avid hunter or for just playing around at the shooting range is offers you plenty. It is powerful and accurate when used. The units easy to assemble as you can see from our Barnett Quad 400 Crossbow Review. It has some great features and favored by customers around the world, especially for the advanced technology used in the crossbow! For some people, it may be a bit on the heavy side but with a great sling carrying this device is going to be a breeze.